In English, there are many confusing terms and one such pair of words is advice and advise, which not only sound alike but also look alike. Due to which people juxtapose these terms however these are different as in the word advice refers to the opinion, view, preaching, counsel, suggestion, recommendation or consultation. Pranav advised me to take the advice of my guide to complete the management project. Your advice saved my life. Keep advising me in future too. 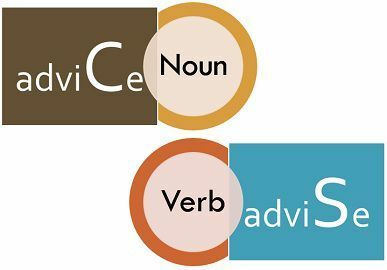 Basically, the noun form of the word advise is advice, so there are not many differences between these two words, still, their difference cannot be ignored. Meaning Advice means suggestion, recommendation or guidance offered to someone, with respect to a future action. Advise means to give or offer suggestion to someone regarding the best possible course of action in a given situation. Determines What a person should do. What should be done in a given situation. Form Remains same. Changes its form like any other regular verb. I will work on their advice. The teacher advised Suhana to talk to her parents about the matter. The word ‘advice’ basically means an opinion, suggestion, recommendation which is offered or given by any person about what you should do or act in the given circumstances. Alisha gave me that advice to avoid receiving calls from unknown numbers. Pratiksha can work on her colleague’s advice. In my advice, you should move to Delhi for better exposure. It was Garima’s advice to visit Kuala Lumpur. Furthermore, in the field of business and law, it means an official record or notice of financial transaction or contract. Example: The company issued remittance advices. Christina advised Sunny to take an umbrella, as it may rain. My uncle is my best guide, as he always advises me on what is right or wrong. The lawyer will advise you about how to take legal action against criminals. I regret to advise you that the project was rejected. ‘Advice’ refers to a suggestion, an opinion, recommendation or guidance, regarding a particular matter, given to someone. On the other hand, the term ‘advise’ is used when we refer to the act of giving counsel to someone, considering the best possible action in a specific situation. While the word advice is a noun, advise is a verb. In sentences, the word advice denotes what someone should do, whereas advise is used to indicate what should be done in a particular case. Like any other verb, advise also changes its form with regard to the sentence, i.e. advising, advised, advisable, advisor, etc. On the other hand, the word advice does not change its form, it is used in sentences, as it is. My parents gave me very good advice. As per the lawyer’s advice, George sued his partners. I seek your advice on this matter. The doctor advised me to take rest for at least five days. Advising is an art and not everyone owns it. According to the weather conditions, it is advisable to stay at home. The primary difference between the two lies in their spelling and so in their pronunciation. While advise ends with ‘ise’ which can be pronounced as we pronounce ‘wise’, whereas advice ends with ‘ice’ whose pronunciation is similar to ‘mice’. Secondly, the advice is nothing but a suggestion, while advise is to give a piece of advice to someone.